The Cumberland/North Yarmouth Lions Club is conducting their 22nd Annual Fresh Florida Citrus Sale. There are three different 20-pound citrus boxes available: all oranges; all grapefruits; or 50/50 oranges and grapefruits. All boxes are $28 each delivered. Orders are due by December 1, 2017 with delivery to your Cumberland, Falmouth, Yarmouth and North Yarmouth door step around December 16th. All proceeds are given to the senior class at Greely High School (MSAD # 51) in the form of college scholarships and to support Project Graduation. Since 1987 over $225,000 has been awarded to date through our Lions' Club efforts. 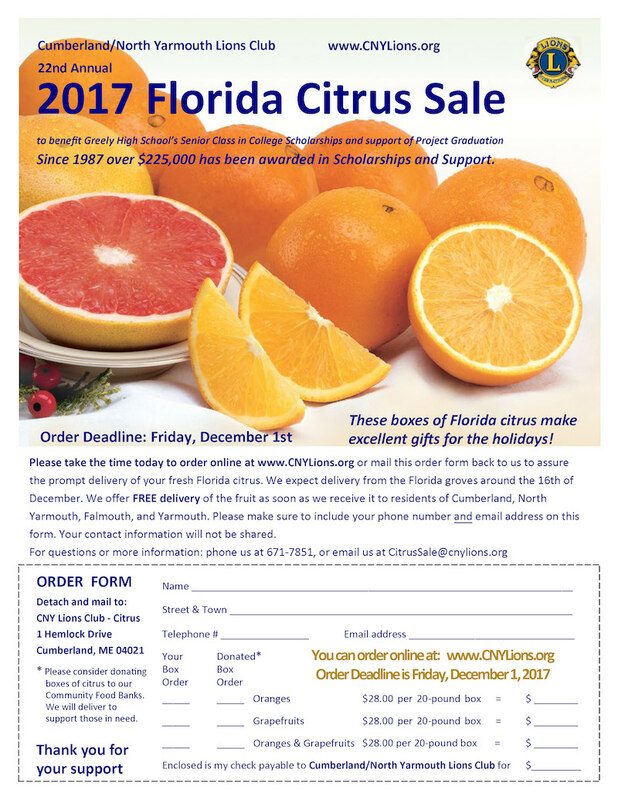 All orders can be placed on line at: http://www.cnylions.org/citrus-sale Or email us at: CitrusSale@cnylions.org Or call: 207-671-7851. Thank you!! !